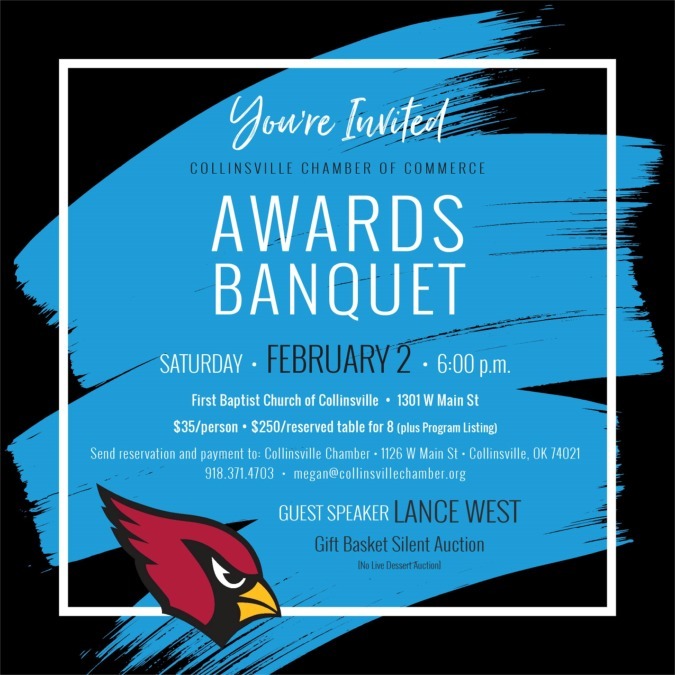 The Collinsville Chamber of Commerce held it's annual awards banquet Saturday, February 2, 2019, at the First Baptist Church. Awards were presented for a successful 2018 and the new officers for 2019 were sworn in. In-coming 2019 Chamber President Shelley Nachtigall outlined her plans for the coming year. 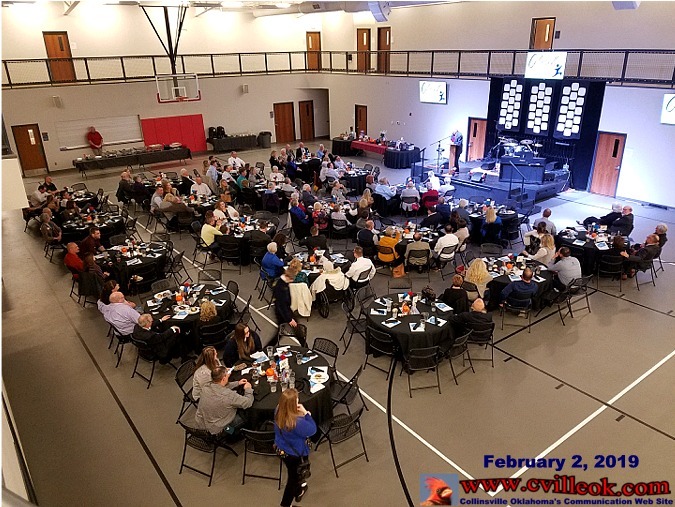 Superintendent Lance West gave the state of the Collinsville Public Schools and described great things continuing to happen there daily. Breann Audet of Nutrition Nook received the Chamber's Gold Key award. Cindy Reed of Cyn-Pro Graphics received the Chamber's Community Service award. City Manager Pam Polk accepted the "Business of the Year" award on behalf of the City of Collinsville. 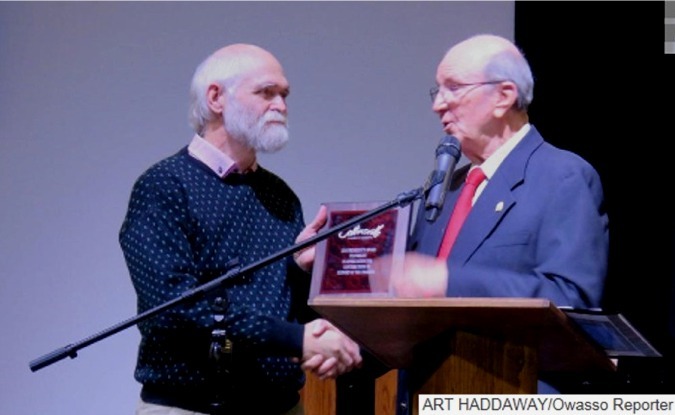 Ted Wright of www.cvilleok.com and the Newspaper Museum In Collinsville received the "President's Award" from out-going Chamber President Ron Evans. Credits to Art Haddaway for the photo. Chamber manager Megan Edwards presented a plaque and thank you's to Ron Evans for stepping in and filling out a year as Chamber President after Robert Miller moved out of state. To the left is Adam Jones who made additional presentations to each award winner on behalf of U.S. Representative Kevin Hearn. 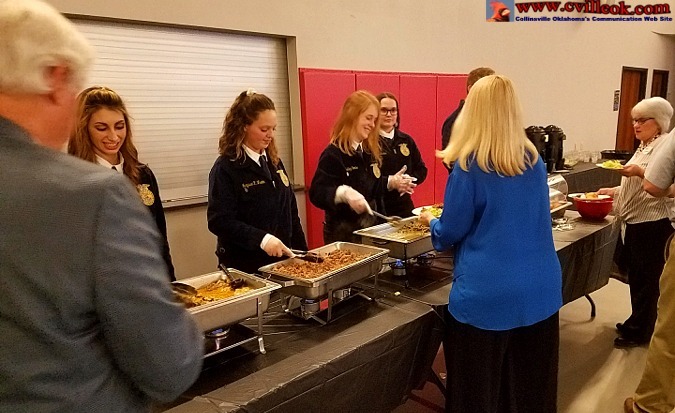 Members of Collinsville's FFA Chapter served the meal provided by Big John Catering.